Distance: 34 Km trekking and approximately 70 km in boat and bus transfers. Special Considerations: When operating, you can choose whether to hike the last 13 kilometers or pay and travel via the Argentine ferry, El Huemul. The trail is hard to maneuver with a bike loaded with gear. Distance bikers should remove pedals and push in some sections. We suggest carrying your gear in a backpack, hiring a porter service or, when in operation, you can send your bike along ahead on the ferry, El Huemul, for a fee. Pack clothing for warm weather, rain, and wind, and extra layers, in case of bad weather, which often comes in quickly and unexpectedly. Hike in shoes that are well broken in and can handle multiple terrains. Be sure to pack extra water and food. Reservations: Absolutely necessary (well in advance), to ensure your place on the boat. The Quetru is operated by Robinson Crusoe – Deep Patagonia; their lodge is located along the Carretera Austral, Km 1240; (02) 23341503 - 23341504; (067) 2431909; info@robinsoncrusoe.com; www.robinsoncrusoe.com. You can book Online. They can also help you with logistics for accommodations in Candelario Mansilla. 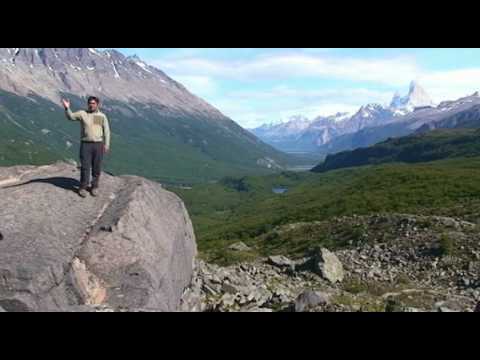 This incredible hike takes you across the Patagonian Andes from Candelario Mansilla, Chile, to El Chaltén, Argentina, crossing the borders in the back-country, by foot. Although it sounds pretty extreme, it is not necessary to be a trekking specialist or even to be in incredible shape for this crossing. You’ll just want to plan your expedition well: carry the right amount and kinds of gear, organize the logistics on both ends and leave yourself a few days so that you can go at a relaxing pace. You’ll start in Puerto Bahamondes, seven km from Villa O’Higgins, where you will need to pay the fees and take the Quetru across the lake. It’s around three hours navigating to Candelario Mansilla, where you can disembark at the morning stop OR continue aboard to take the day long excursion to the O’Higgins Glacier (costs a bit more but completely worth it), and disembark in Candelario Mansilla in the afternoon, on the way back. Candelario Mansilla is named in honor of the first Chilean settler to make these isolated land his home. Today, it consists of a tiny harbor, a border control post, and the home of Don Mansilla’s descendants who have created a campground and rural hospedaje to meet the needs of a growing number of hikers. The inn’s four rooms are very basic, and share a bathroom with the family, but, the homemade meals are delicious and filling, especially before heading out on the trail. When you disembark from the Quetru, you can spend the night or immediately begin your hike, continuing the upward climb along a wide gravel road that winds above O’Higgins Lake and eventually levels off, in route toward a small airstrip. Either way, you’ll need to head up the hill to the Chilean Border Control to process your paperwork for crossing into Argentina. The first 12 kilometers wind up the mountain along an easy but very uneven gravel road. Most hikers opt to hitch a ride from the Chilean Guard Station to the airstrip for around $5.000 CLP. After the airstrip, you’ll enter a beautiful 10 kilometers of trail that wind through high mountain fields and forests, bordering high mountain lagoons, like the Redonda and the Larga, and crossing over the border between Chile and Argentina. The welcome signs marking your departure/entry are a great spot for photos! As you make your way down the mountain toward the Argentine Border Control there are incredible views of Mt. Fitz Roy and the Desierto Lagoon. Be able to access your personal identification, passports, visas, and other relevant paperwork. After clearing customs on the Argentine side of the mountain, around kilometer 22, you’ll walk across a big field toward a rocky shoreline and resume the trail for the last 12 km stretch to the other end of the lake, (on the Argentina side, the lagoon is referred to as a lake). Mt. Fitz Roy will be getting closer with every kilometer you walk so have your camera handy. The trail is well marked, with small metal arrows that lead you through the rolling hills. Around Km 6, after a long climb, the trail arrives at a rocky vista with a breathtaking view of Mt. Fitz Roy and Laguna/Lago del Desierto. This stop serves as a good place for a rest and a snack. Next, the trail gradually descends rolling hills returning you to the shores of the lake. From here you’ll wind along the shore until you reach the dock area. The final two kilometers cross ancient glacial moraine and a few streams before finally ending at a small wooden footbridge in the forest.